Perfect for adults and teens alike this giant sized bean bag will quickly become the heart of any relaxation space. Great for spending time reading, watching sports or movies or simply sitting back and taking some ‘me time’. 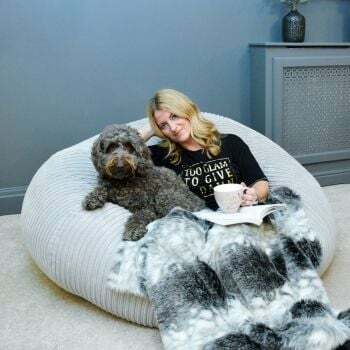 rucomfy’s large Flob A Dob bean bags will mould to your shape offering comfort and postural support, the shape will almost hug you creating a relaxing bean bag chair. Why not complete your bean bag experience by adding a matching footstool, which is also great as a little side table for your book or phone or add a little tray and use for your drink. Our jumbo cord fabric is soft, chunky and cosy and is available in a range of homely colours that will compliment your existing furniture and soft furnishings. The fabric is machine washable and extremely hard wearing making it ideal for any busy home. Great bag. Big & comfy!! Brilliant ! Thanks so much. Quality service and product. We have one of your jumbo beanbags in our living-room. This new one is a gift for someone who loves ours. This is a christmas present for my husband, so he hasn't got it yet, but I have looked at it at it looks a very good quality item. I bought the bean bag as I need a new sofa and thought the bean bag would do as an substitute. In fact the bean bag is so comfortable I think I shall get more bean bags and forget the sofa. Comfortable product, good size, made from good quality and cosy fabric.